Variants are products which have different attributes or options to choose from, such as size, color, material, length or pattern. In Brightpearl, variants are managed in product groups. 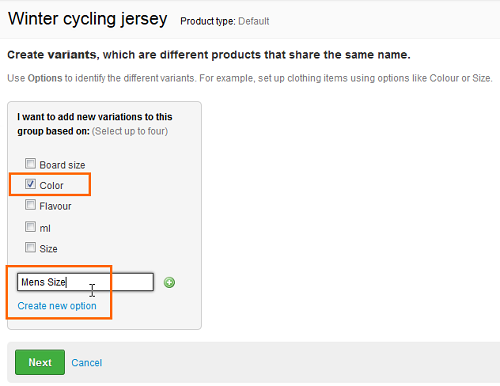 Each variant in a product group is connected by having the same name as its sisters; they are then uniquely identified by assigning options and option values. An option is the type of attribute a product has, for example, color or size. 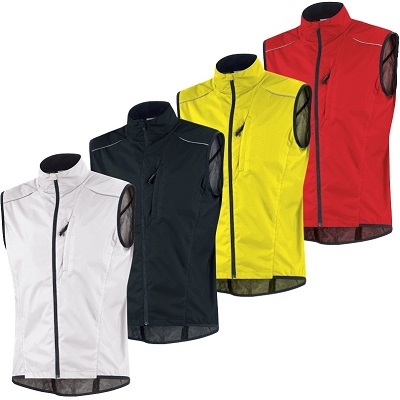 These are managed in Brightpearl at Settings > Products / Inventory > Options. An option value is the actual attribute detail, for example, for the option of "Color" the option values might be "red", "blue" or "white"; for the option of "Size" the option values might be "small", "medium" or "large". Option values are managed in Brightpearl at Settings > Products / Inventory > Option Values. Products which have been assigned options and option values are variants. Brightpearl products can be assigned a maximum of four different options, for example, color, size, material and pattern. 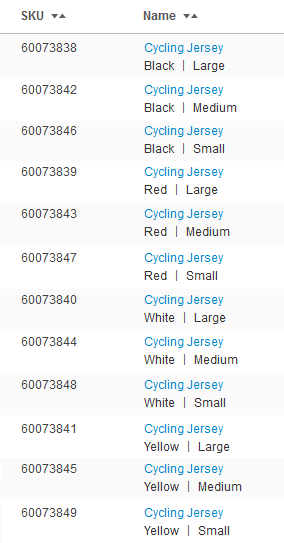 If additional options are required, they can be entered into the product name, for example, "women's jersey" and "men's jersey", where each are then assigned color, size, material and pattern. Variants can be manually created or imported using a spreadsheet. 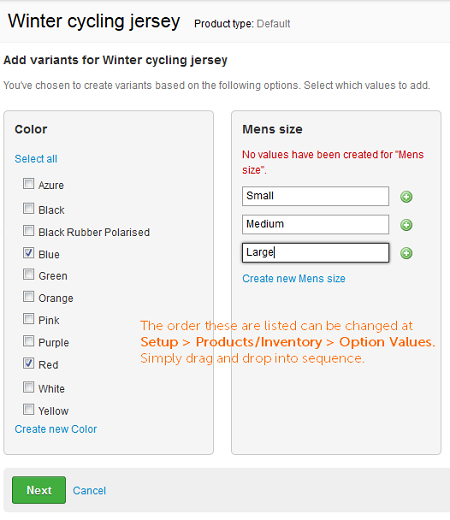 When manually creating variants only a single generic product is created, against which options and option values are then assigned. 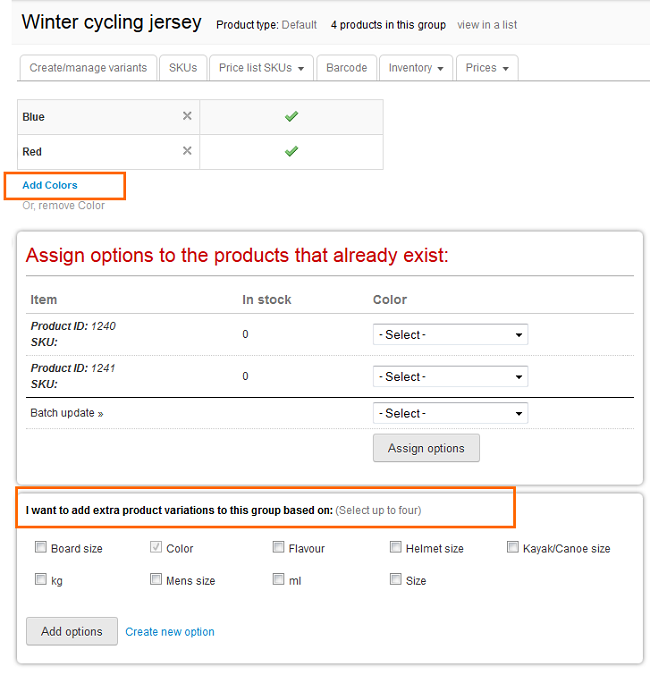 Assigning options and option values will automatically clone the generic product and create a separate product record for each different combination of the option values. When importing variants, each different variant must be listed in the file with exactly the same name. Having the same name will ensure the items are grouped as sisters. 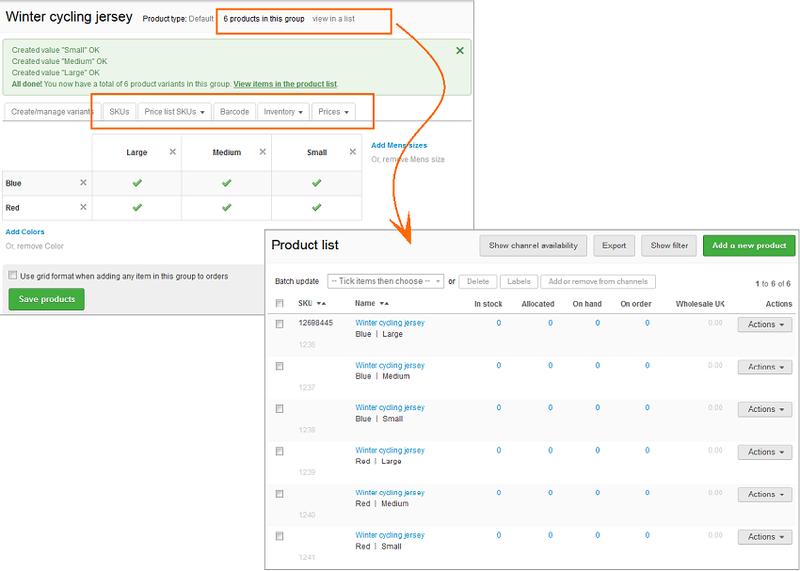 In order to assign option values to the products, the options must be included as columns. Options must pre-exist in Brightpearl at Settings > Products / Inventory > Options before they can be added to import data maps, but new option values can be created as part of the import by selecting the relevant checkbox at the point of import. Go to Products > New product and create the first product with generic information which will be shared across the variants. Save the product and return to the product list. Click Actions > Create variants. Select an existing option(s) from the list, click Create new option and enter the name if it hasn't already been generated. A total of 4 options can be assigned to a single group. Select the option values to assign for each option, click Create new and enter the name if the option value hasn't already been generated. Click the Next button to continue. Continuing will automatically clone the original product and assign the option value combinations. The grid displays the option value combinations now available. Use the tabs to complete product specific details for the group. If you have lots of options, some of which are not relevant to all products, then it might be useful to create product types. For example "waist size" is not needed on products of type "shoe". You'd create a product type for "trousers" which has options of "waist size" and "leg length". Read more about product types in this help center article. 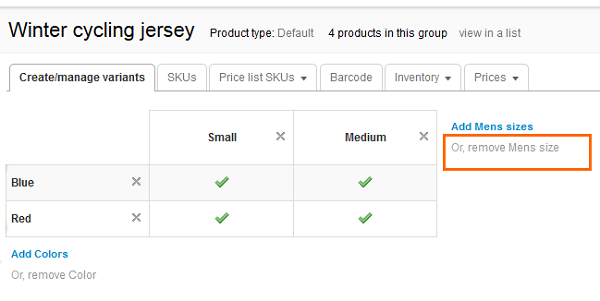 Select this checkbox to use the grid format when creating orders or viewing product stock level details. This will allow you to quickly see which Variants are available and offer your customer another Variant should the one they want not be in stock. When swapping and changing options there must be at least the same number of products in the end as there were to begin. The only way to reduce the size of a product group is to delete product records. Deleting products can be done from the product list but only when there are no financial transactions or orders associated with the product. Go to Settings > Products/Inventory > Option values. 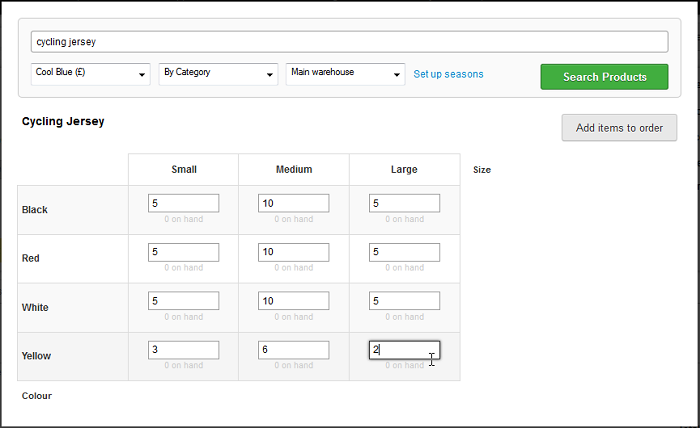 Drag and drop each option value into the desired order. Ensure that the save message is displayed before moving the next item. Go to Products >List products and search for one of the SKUs in the group. Click Actions > Edit variants. In the variant management screen click Amend grid layout. Drag and drop the options into the desired position. Submit the changes and then save the variants. It is possible to delete products from the group whilst there are no related financial transactions or orders. Delete the product from the product list. A product can be broken away from the group by changing the product name on the individual product record. When doing this, the Update item without updating the other sisters checkbox must be selected (shown only after editing the product name). If a variation does not exist in a group it is seen as a checkbox on the variant management screen. 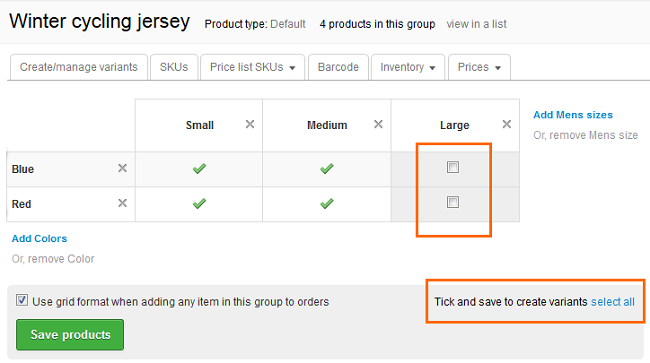 These checkboxes can be used to create new products in a group. New option values can be added to a group by using the add options against the rows and columns. New options can be added to the group using the choices at the bottom of the variant management screen. Before editing product groups and variants export a detailed list of the items and the inventory levels - part of the process of removing or changing options will require all option values to be manually re-assigned to the relevant SKUs. When working with large product groups we recommend managing changes to options using the product import, watch the video here. Go to Products > List products / services. Search for the products. Take an export of the product details and associated inventory levels. Click the Actions button and select Edit Variants. The product group is displayed. Click the Remove link beside the relevant option. Click OK to accept the warning. The option and all the option values will be removed. All remaining variants will say "No product exists". Each of the remaining option values must be reassigned to the products which are now listed below the variant table. 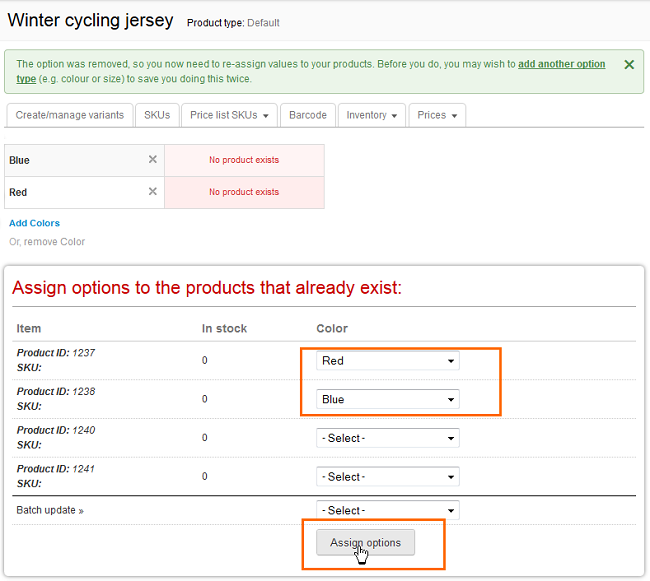 Using the product export from earlier, select the correct option value for each product and then click the Assign options button to update. Delete the products - These products can only be deleted from the product list if they have no financial transactions or orders associated with them. Break the products away from the group - This can be done by changing the product name on those records. Ensure that when changing the names that the checkbox below the name is selected. If this is not selected then the name across the whole group will be changed.